Today Dad picked up the window lettering he ordered to put on the back windows on the sides of his Yukon. Below are two photos he took of it on the passenger's side with his phone. 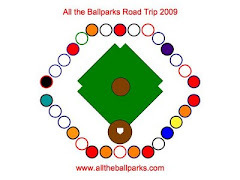 We are going to try to collect team logo stickers as we visit their home ballparks. We got one at the Dbacks, but he has put on the car, yet.